With exception of jodan and nito we don’t often use single handed techniques in kendo. This is understandable as they are seldom taught and are difficult to do well. Kendo is primarily the art of two handed fencing, but katate waza do exist and therefore have a place in the kendo tool kit. The advantage of katate waza is that the give the player extra reach, the disadvantage is that they can make you break your posture and result in untidy looking kendo. To use them you need to be at a level where you have developed good posture and tenouchi. Not all techniques can be performed with one hand, but two waza stand out as being relevant and useful when used in this way. One is katate tsuki the other kote katate nuki men. With both it is essential that you drop your right hand to your right hip as you start the technique. 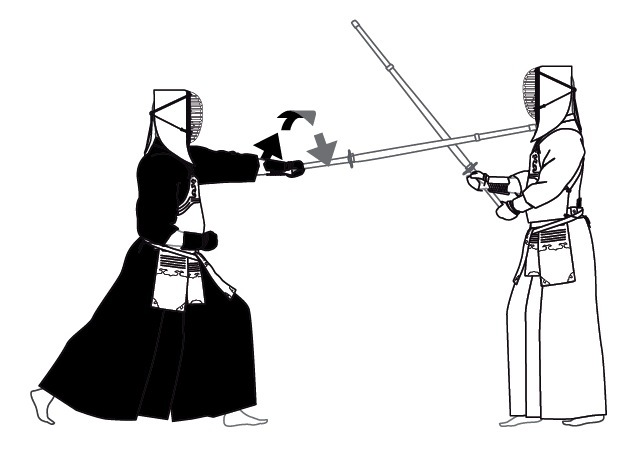 Katate tsuki is useful against jodan, it gives you extra distance which takes away some of the jodan players advantage. To make it work you need to push forward with your left hand while rotating your wrist inwards. As you release your right hand from the tsuka, you should pull it in tight to your right hip. This has the effect of bracing your core and keeping your posture solid. It goes without saying that like morote tsuki, the move should result in a controlled in-off hit to eliminate the risk of injury to your opponent. With kote nuki men, you avoid the kote by dropping your right hand to your hip as you raise your left hand to jodan height and immediately make a yoko men strike to your opponent’s right side. Again the benefit is that you gain extra distance. It is essential that you maintain good tenouchi and cut down rather than to the side. The target is between the men himo and the centre bar of the men. A roundhouse swipe to your training partner’s ear is unlikely to be well received. These are useful waza but they are not ideal for beginners. You need to have developed good kendo basics and posture before trying these and I would suggest that you don’t try them in grading examinations. They are however useful shiai techniques and if used only occasionally can surprise your opponent.